The A.S.K.A. has recently and proudly added Remy Presas' Modern Arnis training system to the class roster. Modern Arnis is a Philippine martial art that encompasses training in short stick, knife, sword, dagger and empty hand techniques with a heavy emphasis on small-circle ju-jitsu. The system is under the local direction of Sifu Edgar Cordova in Tucson, and the national direction of Grand Master Jeff Delaney in Texas. Arnis has also been known as "kali" and "escrima". Although all 3 terms mean essentially the same thing, there are variations in the many styles found throughout the numerous islands of the Philippines. The word "arnis" is simply a more indigenous Tagalog term, Tagalog being the Philippine national language. In addition to regular training, seminars and workshops given by more advanced guest instructors will become periodic features of the curriculum and will keep things lively and interesting--an added benefit. Regular training in Modern Arnis directs students to develop an seamless "flow" of movements whether attacking, or blocking and countering. Early attention is given to mastering the system's 12 basic striking angles along with their analogous basic blocks, then building on these to learn 12 basic disarms and various trapping and countering maneuvers. Once these basics become familar, a wide variety of other more advanced concepts come into play involving joint locks, takedowns and throws, ground fighting, and counter-attacks in response to other counter-attacks, all with seemingly endless potential for variation. The founder of the style, the late Remy Presas, was born in a modest fishing village in Hinigarin, Negros Occidental, in the Philippines. He began training under the guidance of his father, Jose Presas, at age 6. As he matured, he travelled extensively and continued to study the numerous fighting systems of his native country which are combinations of the various arts that reached the islands. The veritable cornucopia of martial styles existing among the islands was faciliated by the Philippines' favorable position along trade routes and the inevitable exchanges and confrontations that accompany life in port towns. History indicates that Thailand, China, Spain, Indonesia, Japan, and India were among the countries who frequented this area, and it's interesting to note that all are countries with well-developed and notable fighting systems. 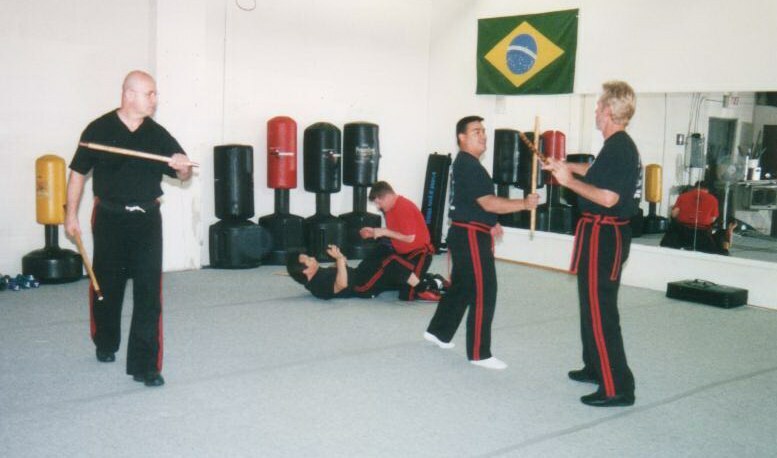 In addition to emphasizing the concepts of flow and the capacity for continuous exchange, economy of movement, endless variation, and some positively wicked locks and traps that can be implemented with a weapon or without, training in Modern Arnis is generally just plain fun due to the friendly and "we live in the real world" perspective of it's instructors and higher rankers. While Modern Arnis can certainly stand on it's own two canes in terms of having the right "martial stuff", practitioners of other martial arts will find that that it can compliment, and even improve and expand their understanding of their "base" art. It can breathe new life into the zest for training that longer-term parctitioners all need periodically, and/or take one's understanding of "the bigger picture" in martial training to a whole new level.